Home Staging is preparing a house for sale; making the most of every space so that it will appeal to as many buyers as possible. It is cleaning, de-cluttering, de-personalizing, repairing and up-dating when possible; and finally adding the elements that make a home attractive, stylish and inviting to the home’s target market. This is best done by a professional who specializes in this type of decorating. We will view the home objectively, as a house to sell instead of the family home; this is often difficult for the homeowner. 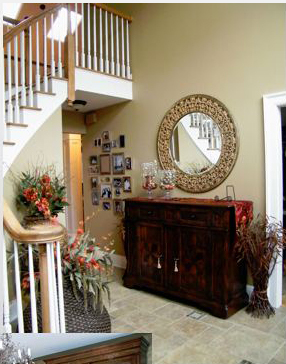 We will downplay the home’s flaws while highlighting it’s finer points. Home Staging is keeping costs as low as possible while creating an inviting and stylish atmosphere – a place buyers will want to call “HOME”.